It's not very often there is a clear sky and a comet in my limited view from the balcony. 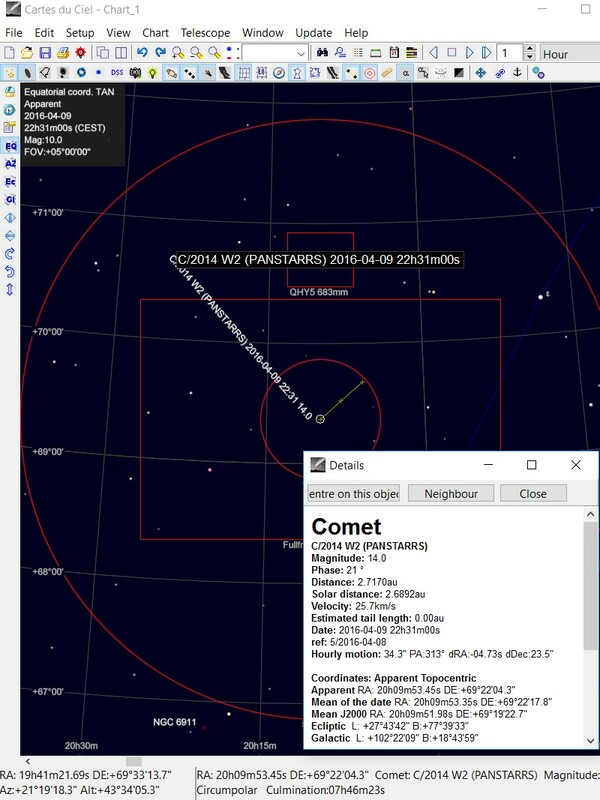 But now in April 2016 the comet C/2014 W2 Pan-STARRS is there and tonight the sky is clear. Here is all the programs that I have running to catch the comet, they are all updated to the latest beta version of today (April 2016). The idea is to indirect track on weak comets that are not visible on the sub images, but later when stacking them together (without align) the comet will maybe be visibly. 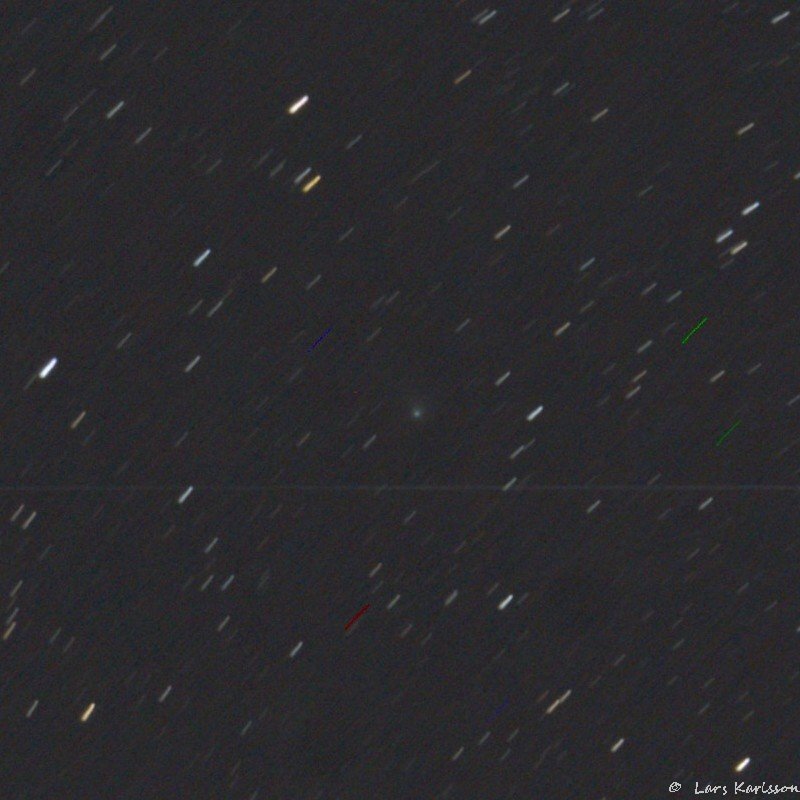 This comet is of magnitude 14 and is not very weak, it will be visible even on the sub images. No, something went wrong, you see the comet in the center. 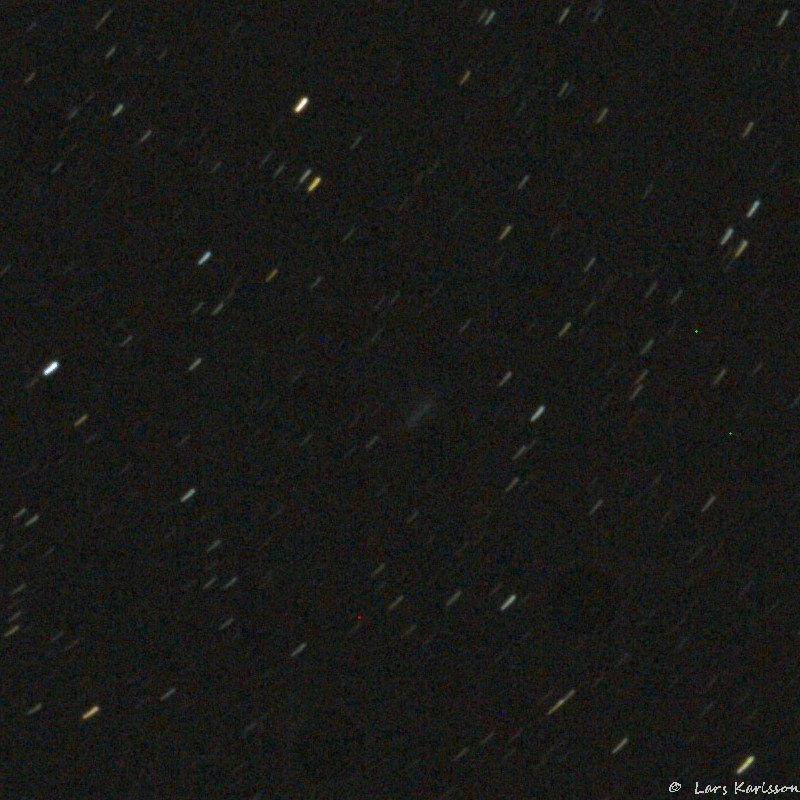 All these 45 sixty seconds images are stacked on top of each other, no align as it shouldn't be necessary when guiding (indirect) on the comet. A little bit strange because what I can see all settings are correct. Notice that the comet track is longer than the star tracks. Did it correct in wrong direction? I have had problem earlier to get the information in EQMOD to be correct. If the telescope does a meridian flip the camera will be upside down and the other programs must know this to be able to set the sign of move to the right direction. 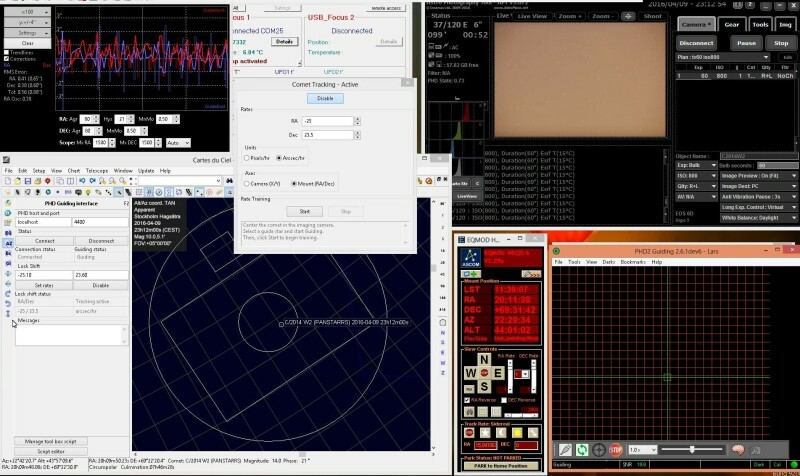 In this case it should be "Pier side West, telescope pointing East", when I now look at the screen dump I see that it hasn't been updated as it should, EQMOD say "Pier side East, telescope pointing West". Could that be all that is wrong? It worked with the earlier EQMOD versions when I tested on asteroids. Now the comet is easy to see. 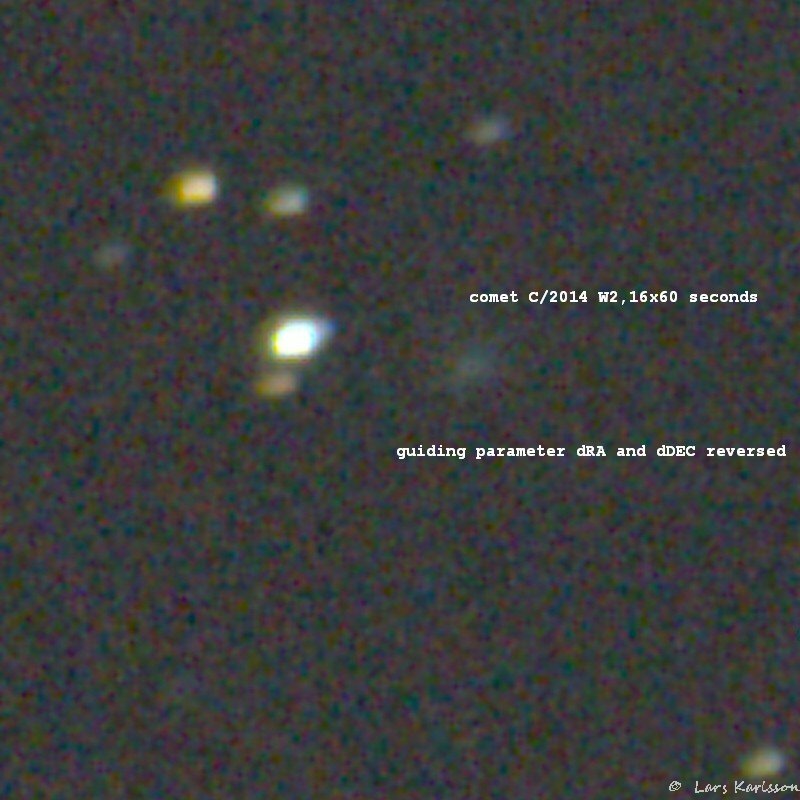 The first image taken 20:30 and the last 21:27 UT. The photo session lasted 57 minutes. Pixel scale about 2"/pix, image size 800x800 pixel. Polar align precision is about 8' last time I did a check. Camera oriented along RA axis. The dRA speed differ from the data sent by CdC to PHD2, but it should. CdC correct for Declination, COS(a). The direction on comets move is north and west (up and right in this photo). The dots on the yellow line correspond to one day. The big rectangle is my 2x3 degree field from full frame camera and the small rectangle is my off-axis guide camera's fov. It correspond to what CdC send to PHD2. 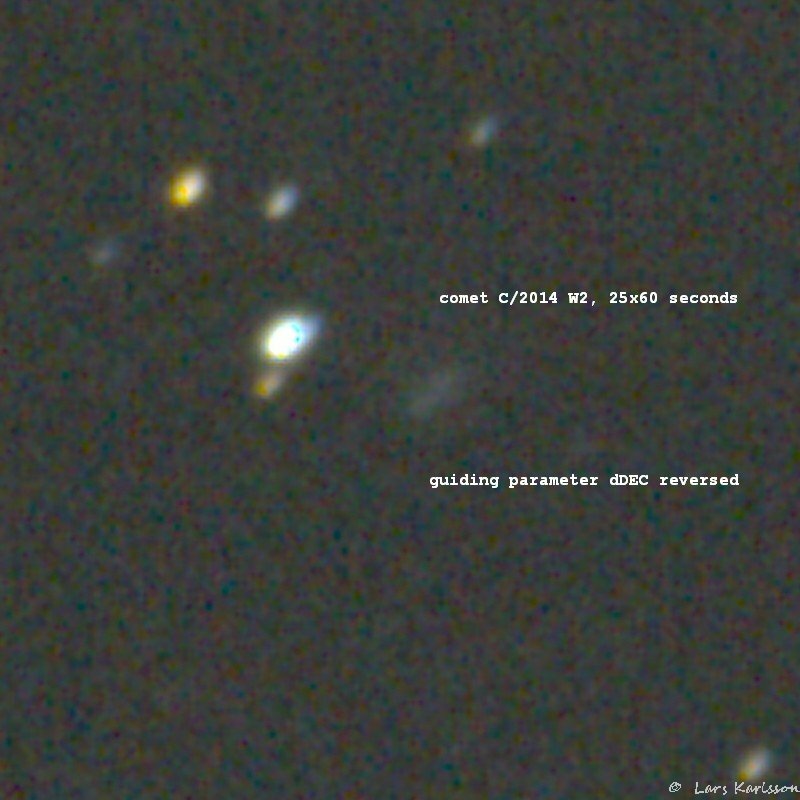 I did some more test where I manually reversed the comet relative speed parameter, first only dDEC. First test, only dDEC reversed. Now it looks much better, the bad thing I couldn't do equal numbers of sub frames. And I also have a 8' bad polar align. Maybe just by luck this looks better. I will come back when I have found out what's wrong.